Visits to coffee houses were a frequent indulgence when I live in Vienna in my early twenties – my drink of choice was velvety hot chocolate slathered with just-whipped heavy cream, dusted with cocoa powder. 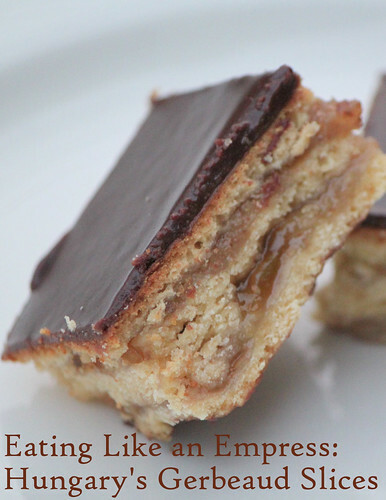 Eclairs, steamed cakes, moussed slices, meringues, puff pastries – the coffee house cases always seemed stocked with some new-to-me delicacy just waiting to be sampled. And while Austrians tend to get frequent accolades for sweets, I came to find their neighbors to the East had pastries that rivaled anything you'd find in Vienna's legendary cafes. Hungary's capital city, Budapest, is home to the Gerbeaud Café, the kind of place that still echoes its roots, which date back to 1858, and a talented pastry chef by the name of Emil Gerbeaud. The Swiss confectioner created many of the pastries that became mainstays for the Café, including his namesake Gerbeaud Slices. Gerbeaud Slices (Gerbeaud-Szelet) have a distinct sophistication – crafted with a yeasted dough that hugs apricot jam-sweetened walnuts between its layers, each slice is topped with a silky finish of dark chocolate. 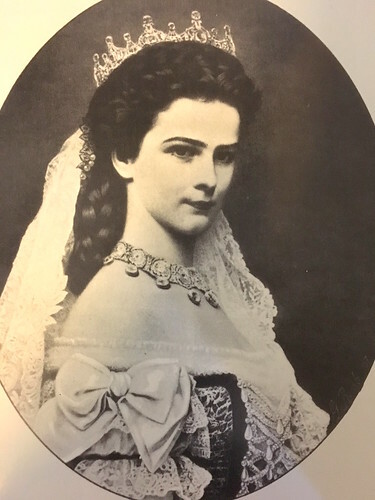 No wonder the Café became a stopping point for royalty, most notably Empress Elisabeth of Austria, the Bohemian beauty was also crowned Queen of Hungary in 1867 in Budapest (more recently, the list includes the likes of Princess Diana, Queen Beatrix of the Netherlands, and Queen Elizabeth II). 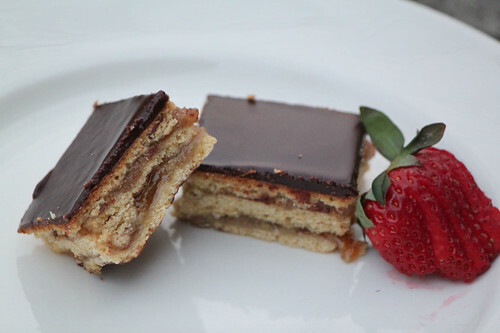 This approachable recipe from Rick Rodgers' cookbook Kaffeehaus: Exquisite Desserts from the Cafes of Vienna, Budapest, and Prague, will help you capture all the old-world flavor of Gebreaud Slices without booking a trip to Budapest (although I'd highly recommend visiting). Stir yeast into heated milk and allow to sit until dissolved (about 3 minutes). Whisk in egg yolks, vanilla, and almond extract. In a food processor, mix together dry ingredients, including flour, sugar, and salt. Add in butter and pulse until the mixture resembles cornmeal. Then pour in the yeast. Process until the dough becomes sticky--akin to sugar cookie dough. Knead the dough on a lightly floured surface and then seal in plastic wrap. Refrigerate for 1 hour. Pulse the walnuts and sugar together in the food processor until they resemble cornmeal. Coat a 9x13" pan with cooking spray. Add a piece of parchment paper (or waxed paper). Spray again and spread with flour. Tap out any excess flour. Divide the dough into 3 equal pieces. Working with one piece at a time (the other two remain sealed), roll out the piece into 9x13" using as little flour as possible. Heat the jam until warm. Place the dough into the pan and spread with 1/2 cup jam and then sprinkle with half of the walnut mixture. Repeat using the second piece of dough and the remaining jam and walnuts. Use the third rolled out piece to top. Allow the assembled dough and filling rest in a warm place for 1 hour (don't worry if you don't see the dough rising; it's not supposed to). Preheat the oven to 350 degrees Fahrenheit. Bake for 30 minutes or until the top is just barely browned. Cool for 1 hour. Meanwhile, make the icing by mixing sugar and water in a small saucepan. Boil until the mixture thickens to a syrupy consistency--add in chocolate, remove from heat and whisk until smooth. Mix in butter and salt (and cocoa powder, if using); whisk. Allow the mixture to keep cooling; it will continue to thicken. Remove the pastry by gently lifting it out of the pan using a corner of the parchment paper. Invert onto rack; place the rack on a cookie sheet. (I put a large piece of aluminum foil over the top of the pastry and then carefully flip.) Pour the icing over the pastry. Eat any chocolate drips leftover on the cookie sheet. Refrigerate the pasty until the icing is completely set; cut the pasty into slices. Store in the refrigerator for up to a week.